In 2014, nearly 84% or 122 million people filed their income taxes via efile, exceeding their goal of 80%. Especially, if you’re receiving a refund, it’s the fastest way to complete the April chore. But don’t forget about your records! The IRS recommends all returns and any supporting information (W2s, 1099s, etc.) be kept for three years after the filing date (That’s when the statute of limitations for an IRS audit expires.). For this year, you would keep the documentation through 2018. If your income is underreported by 25%, the IRS can go six years back, seven if you claim a bad debt or worthless securities loss so you should keep records in these cases at least that long. If you do not file a return or a return is fraudulent, keep your records indefinitely. Do not forget about your state record retention requirements. While most states follow the federal guidelines, some state statute of limitations are different. For example, in Michigan, it’s four years after a return is filed or required to be filed. You might not have the copier it takes to effectively run copies of your records, but your Postal Connections store does. 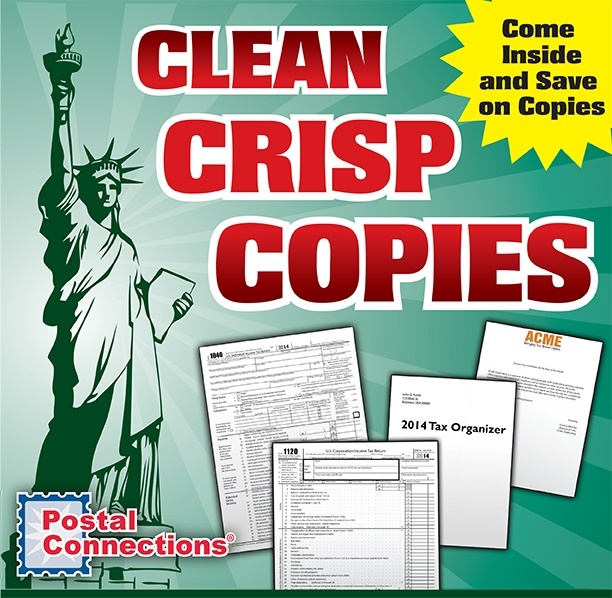 Come on in and copy all that you need to stay compliant with the IRS. It prevents the aggravation of having to retrieve everything in the event of an audit or some other need for the records.